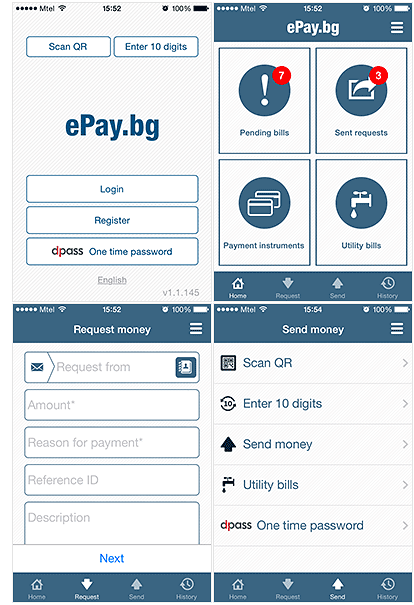 With the ePay.bg mobile application for iOS and Android you initiate payments and receive money quickly and securely. An easy way to check and pay bills to most utility companies, mobile operators and financial institutions. Receive push notifications for new obligations. Send money to your relatives and friends by specifying the e-mail account or mobile phone number of the beneficiary. You have the opportunity to shop at online stores. A convenient way to ask for money from your friends or business associates. Add an explanatory text request, or attach an invoice or other documents. Send an e-mail or text message to the recipient with instructions and a code for payment. Easily track all incoming payments. Check your balance at any time for cards registered in ePay.bg. You can access information about past transactions and for payments received through your Microaccount.